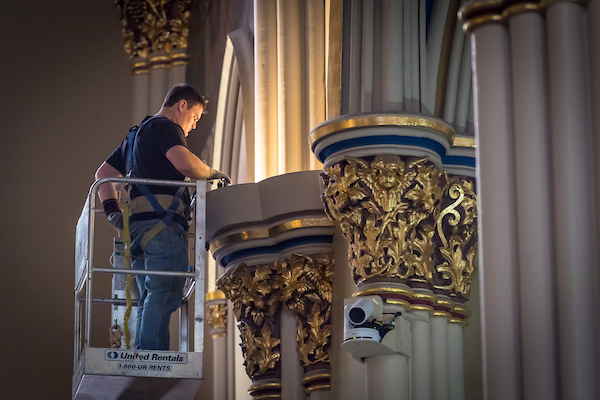 In 2018, the Basilica of the Sacred Heart and Stepan Center received light fixture makeovers in 2018 that are more than cosmetic. These upgrades are part of the Sustainable Lighting Project, which supports the University’s ongoing Energy Conservation Measures Program to reduce its environmental impact and increase economic savings. The lighting project is illuminating in more ways than one. The change from incandescent, fluorescent and metal halide light bulbs to more energy-efficient LED lights saves money on energy costs and reduces hazardous waste disposal. It also provides richer, higher-quality lighting throughout the Basilica, which opened in November 1849. The shift resulted in a 78 percent reduction in kilowatts used (from 37,607 to 8,149) and a 128,894 kilowatt-hour annual reduction in energy consumption, which is equal to planting more than 24 acres of trees per year or removing more than 17 cars from the road each year. The Basilica’s updated lighting also yields a significant reduction in labor and maintenance costs. The interior ceilings soar 60 feet high, making the process of changing the bulbs more difficult than most buildings on campus. 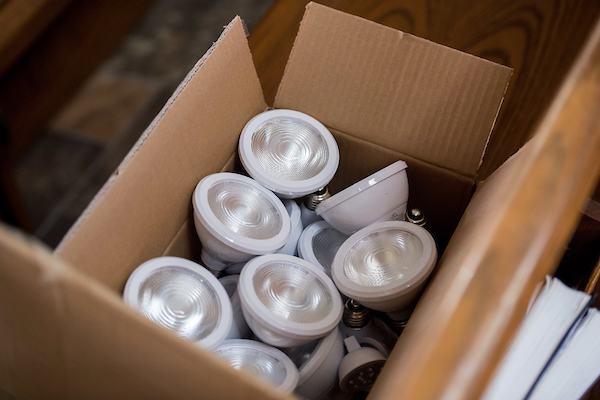 Since LEDs have a much longer lifespan, bulbs typically require replacement just once every 10 years compared to incandescent bulbs, which require replacement one to two times a year. In Stepan Center, 40 metal halide fixtures were replaced with energy-efficient LEDs. This update resulted in a 58 percent reduction in kilowatts used and an annual reduction of 31,800 kilowatt-hours in energy consumption, which is the equivalent of removing four cars from the road per year or planting a little over 6 acres of trees each year. An additional benefit of this lighting project is that the lights now come on instantaneously, rather than the previous five-minute wait metal halide bulbs require. Each of these sustainable lighting projects contributes to a decrease in carbon emissions, reducing the campus carbon footprint by approximately 123.7 tons per year. Continuously, Notre Dame Utilities is looking for applications to conserve energy. LED lighting is a great way to support campus efforts to be more sustainable. Originally published by Donnetta McClellan at evp.nd.edu on September 26, 2018.